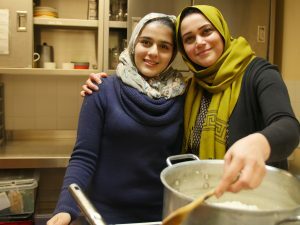 Elahe and Parastoo: The mother-daughter Iranian duo! My name is Elahe and I am from Iran. Not being able to communicate was one of the biggest barriers I faced when I arrived to the UK. I was introduced to Jess through my dear daughter Parastoo and since then I have become very engaged and eager to dedicate myself to Migrateful. It has helped me to improve my confidence and self-esteem and to believe in my capabilities. I am cooking with love and passion again like in the old days. Food is a very special thing to me – I remember as a child waking up to the smell of my grandmother’s cooking and it’s beautiful aromas as she added the ingredients in the early mornings. I would like to thank Migrateful for offering me this great opportunity to make friends, use my talents and to succeed. It is hard not to love Iranian food. 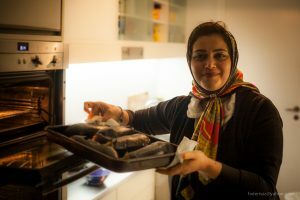 Typical Iranian main dishes are combinations of rice with meat (such as lamb, chicken, or fish), vegetables (such as onions and various herbs), and nuts. Fresh green herbs are frequently used, along with fruits such as plums, pomegranate, quince, prunes, apricots, and raisins. Characteristic Iranian flavourings such as saffron, dried lime, cinnamon, and parsley are mixed and used in special dishes. My name is Parastoo. I am from Iran. I grew up in the capital city Tehran, which is a very noisy and crowded city. When I think about Tehran I think of streets full of pastry shops filled with different types of savoury sweets, which is beautifully designed in a shiny see through containers. The creamy pistachio cakes are the most popular cones that people approach to first. In Iran food is very important, not only what we eat but the quality of what we eat is actually important. It’s a way to connect and socialise with each other. You could even find people in debt who choose to spend money on good food. 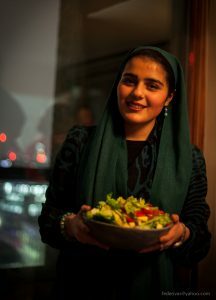 Iranian food is very colourful and takes attention and time to prepare. Personally I love cooking because I think its a way to express my creativity, I grew up eating my mum’s food who is very creative and bold with her cooking. I feel proud when people ask my mum to cook for big celebrations, because they know she can manage to prepare the traditional and delicious dishes.